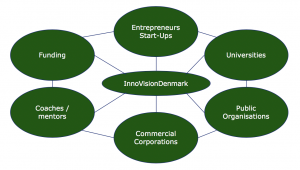 The InnoVisionDenmark association was founded in 2018 in order to create a better basis for pre-startups in Denmark, including potential global winners, to become commercial successes. The goal is to contribute to Denmark get into the global Top5 for entrepreneurs / start-ups. The period up to 2019 is dedicated to "sprint development and testing" of a new eco system for especially "pre-startups", ie brand new companies started by eg. employees, students and / or alumni at DTU and other universities. It includes tests in collaboration with specific start-ups. In this short run, we will speed up, create, test and evaluate ideas for "Global Next Practice" in anticipation of pre-startups. It is done in collaboration with other organizations who want and can contribute. A digitized global and local network can create "next practice" to attract and match people who together can make startups for cowardial successes. We reuse good ideas and solutions, we work together locally and globally - innovation, vision and contribute to "connecting the dots". Many start-ups get support from eg. universities and public schemes - but before the idea is commercialized so much that companies co-invest, they are overtaken or "die of resource shortage". InnoVisionDenmark will actively create a brand new unique global / local eco-system, which will be a huge advantage for the individual start-up and at the same time help bring Denmark to the global top5. We are proud of involvement and substantial commitment from strong organisations including the Novo Nordisk Foundation, DTU – the Technical University of Denmark, PwC and Innovation Center Denmark. We cooperate with Valuer. Joel Beilin, who has experience within partnering between Universities and businesses heads InnoVisionDenmark.